- This is a lighter than cardstock paper weight. 104 gsm which works with most ink jet and laser printers. 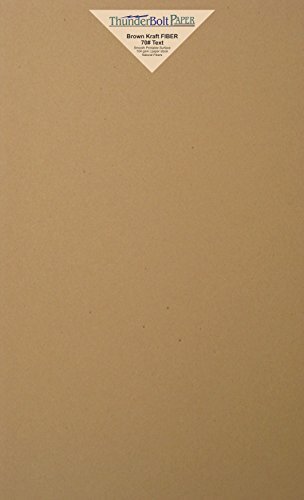 - Brown kraft color blends nicely with the darker kraft brown and will show darker inks best. - With characteristics similar to handmade paper, subtle darker specks from small fibers of pulp are randomly distributed throughout each sheet. Quality Text/Offset Stock to Make Your Project Look Great! -Printable surface which is fairly smooth makes this paper fun to use in your poster making, hand crafting, scrapbooking, and other fun diy projects. -Earth tone enthusiasts like the natural fibre and earthy look. -Acid-free and Lignin free Recycled paper with 30% post consumer waste, as good stewards of the environment. A great mix of recycling and processing to get the just right native look of fibers poured and pressed into paper. They make some of the best invitations and displays which may become keep sakes. Click the orange Add to Cart button to buy now and we'll get your Brown Kraft Fiber Paper on the way!